It all started with one tie. One taste of the forbidden or the rare or the exceptional and then, our viewpoint changes. The ordinary seems . . . well, just ordinary. 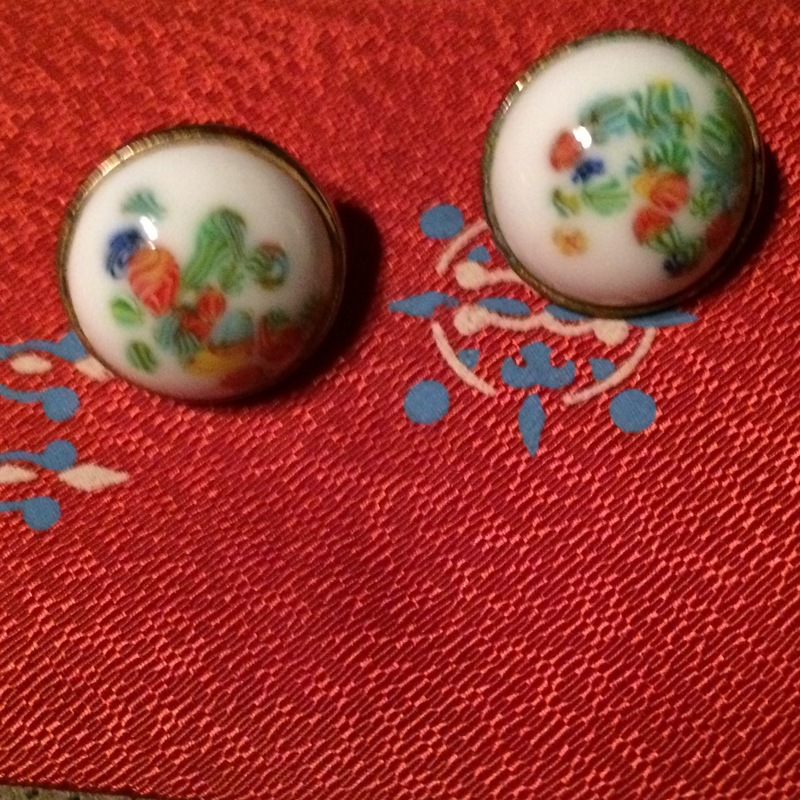 The first necktie belonged to my father. He had a collection of old ties and I loved them! Silky and so funky. I inherited them, then gave them away – except for one. Olive green with orange paisley . . . it seemed to add a dash of pizzazz to whatever I wore. It is over four inches wide, crafted from silk by Hy Value Cravats. I have another tie in my collection that is from the sixties – very narrow and a lot more conservative than my father’s tie! This tie is an all silk tie manufactured in England but has the retailer’s mark also, The Squire Ltd. in Columbus Ohio. This tie belonged to my sweetie – it is very worn with frayed threads! 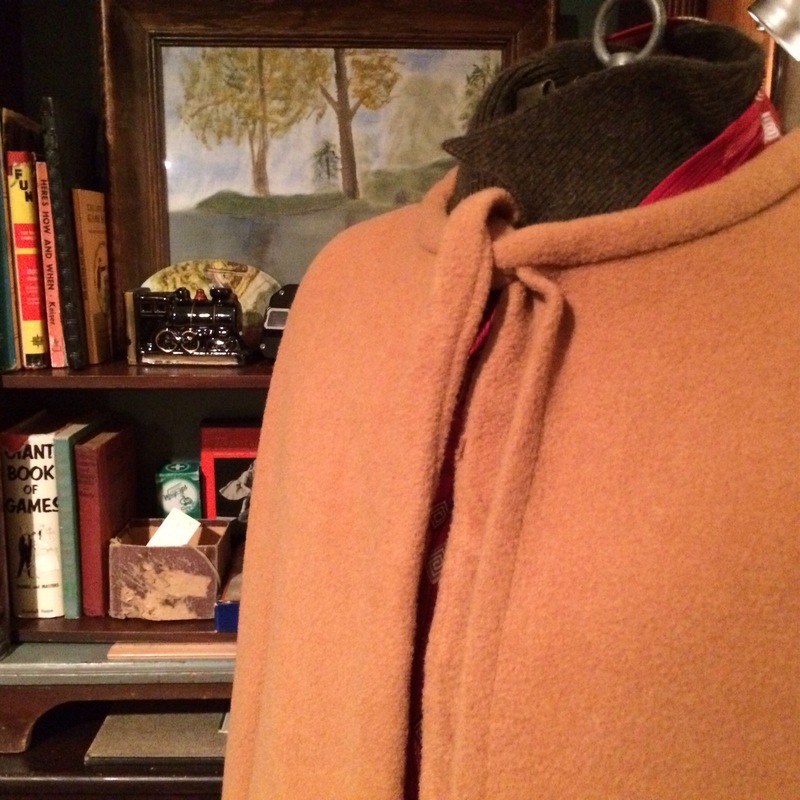 He was not a clothes hound – in fact he prided himself on a closet that was almost empty. A man of simple needs with one tie that he wore – a lot. 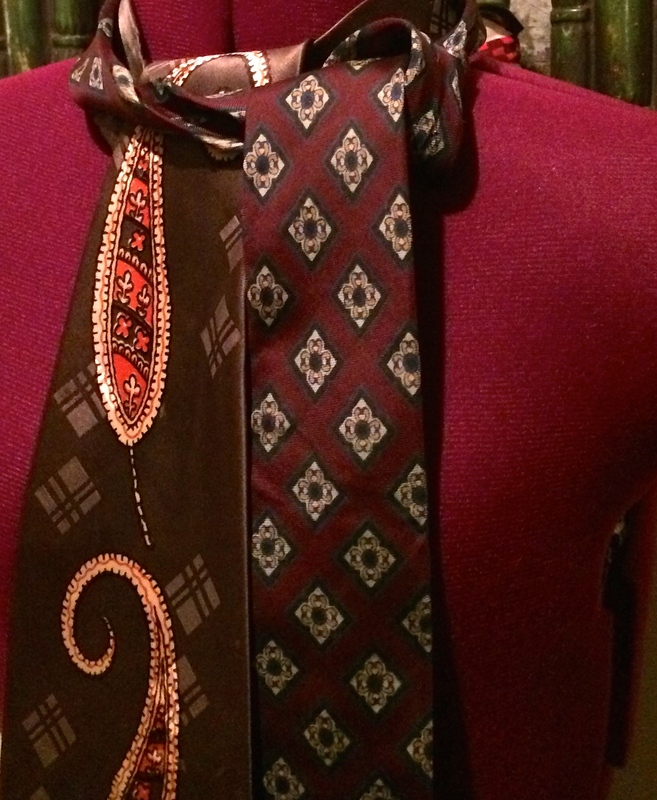 The two ties are a study in contrasts – nope, as much as I love him, I did not marry my Dad. 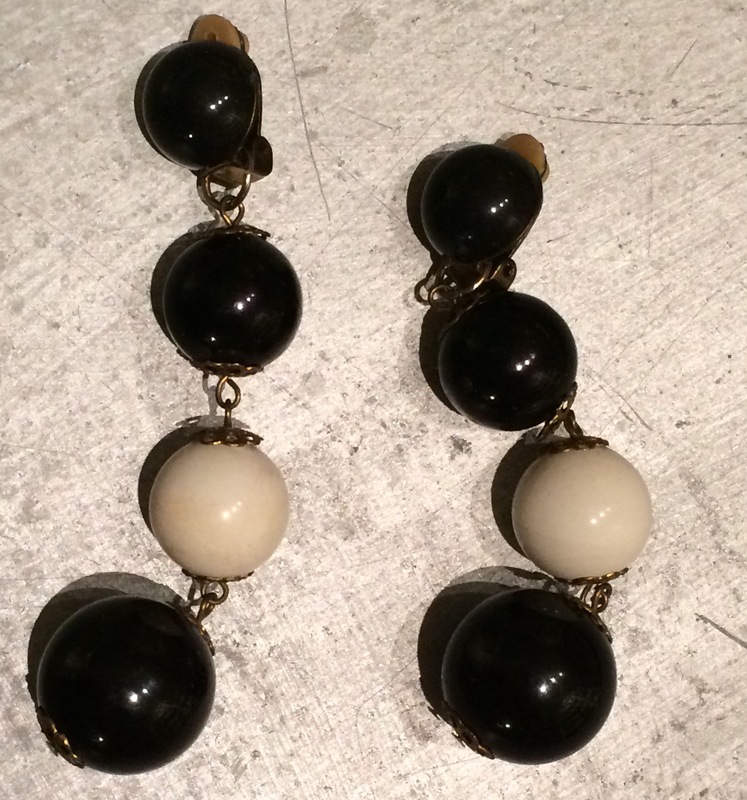 Lately a lot of earrings! They are so interesting that they deserve their own little vignette. From Hand Painted Porcelain to Mod Sixties! 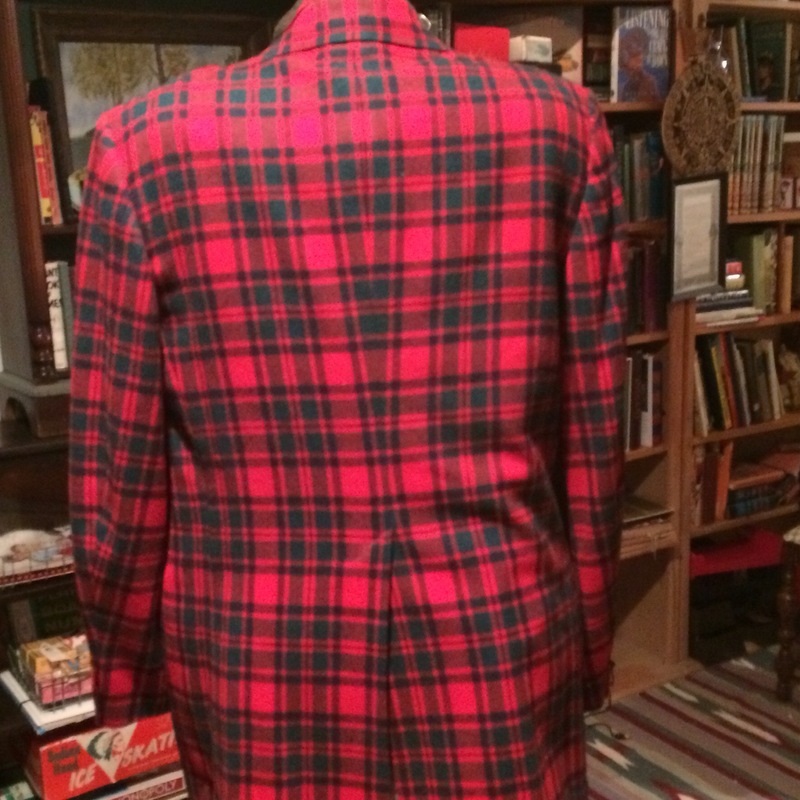 Thanks to a random sequence generator, the red plaid jacket has found a new home! This has been fun. We will do it again on Monday – so stay tuned! To enter, just leave a comment! Drawing is Friday, December 12, 2014. Not sure how it happened. There are so many coats here that I want to name them. Not such a far-fetched idea because they each have a personality of their own. I have decided to show them without much editorial since they speak volumes. 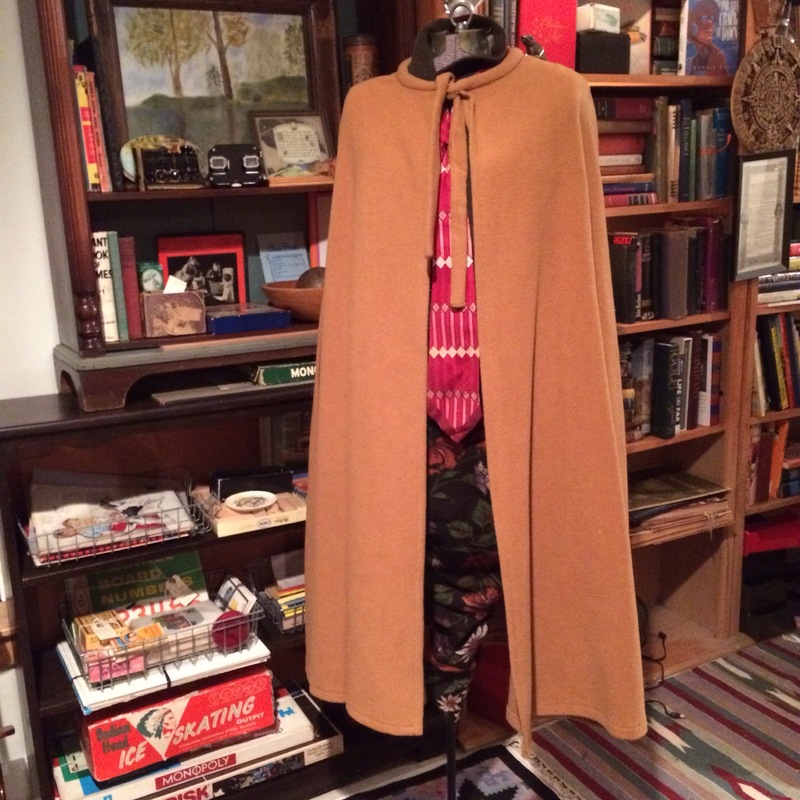 The first coat is not a coat, but rather a Hand-Made Cape in Wool. Next, a car coat, so named because the shorter length is easier to negotiate the getting in and out of a vehicle! 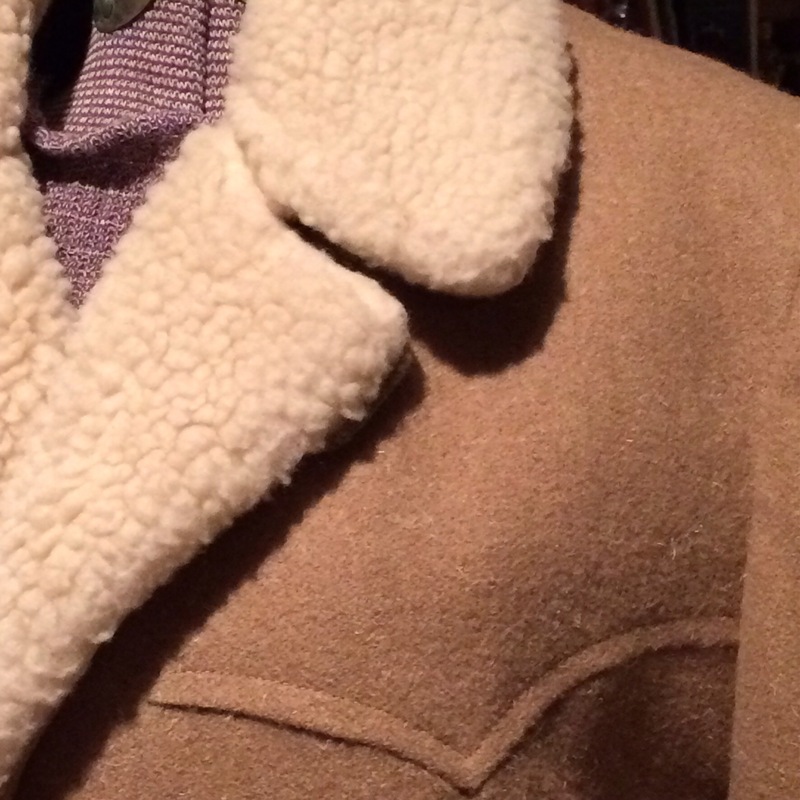 This Pendleton Coat for men, kind of looks like a rancher might wear this on Sunday. 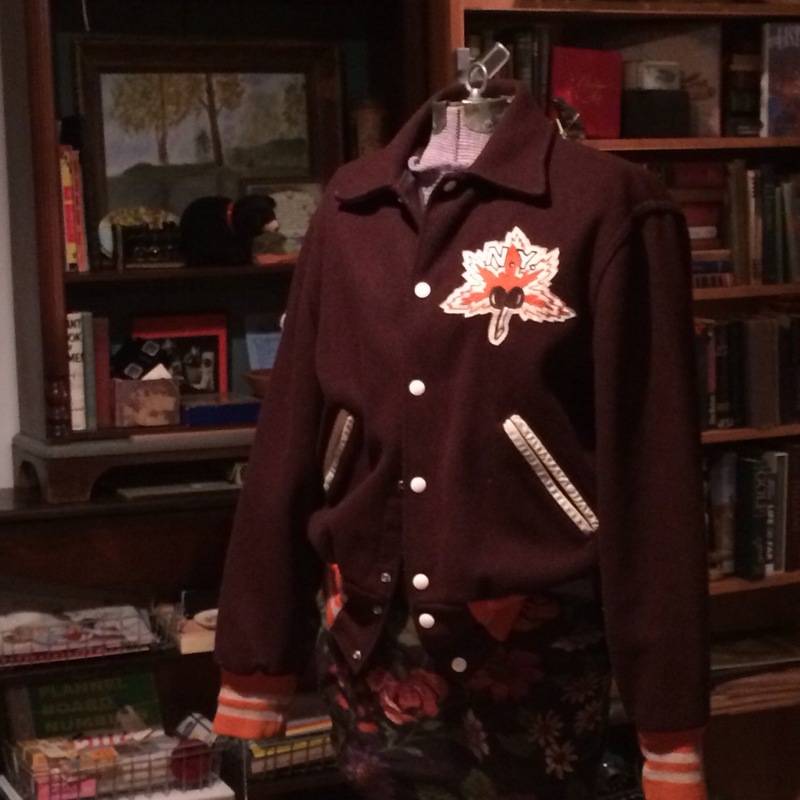 A Varsity Jacket from High School. Tell me, have you ever had a cute young man slip one of these on your shoulders? 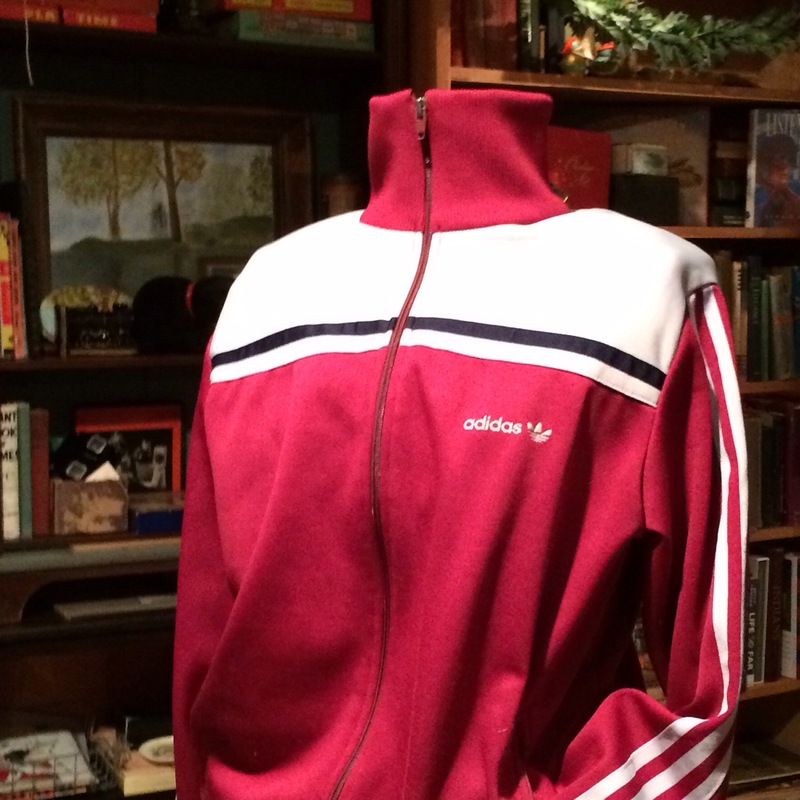 A zippered light-weight jacket for running – this one is Adidas. Pretty cool! Look at the buttons on this coat! So June Cleaver! Then, for another day, a going to the city and I want to stay warm because it is so cold outside coat. With this coat, no one will care what you have underneath. 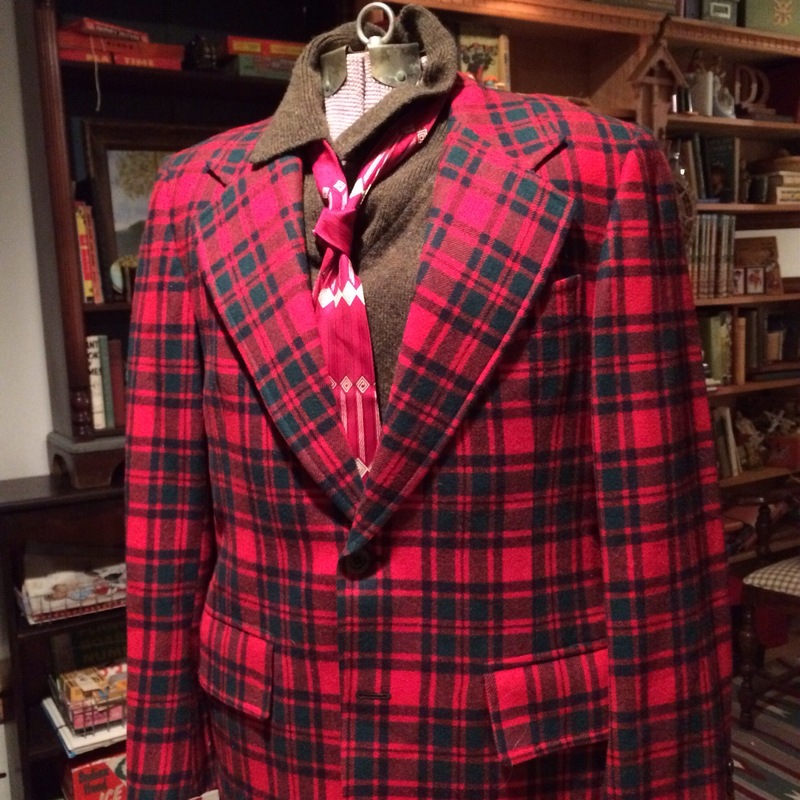 This red plaid jacket by Pendleton is just about the nerdiest, ugliest jacket that I have ever seen. I thought about this jacket and ugly sweater contests. I just know this jacket would “win” the ugly Christmas Contest. . . So, I decided to give this jacket to one lucky person! 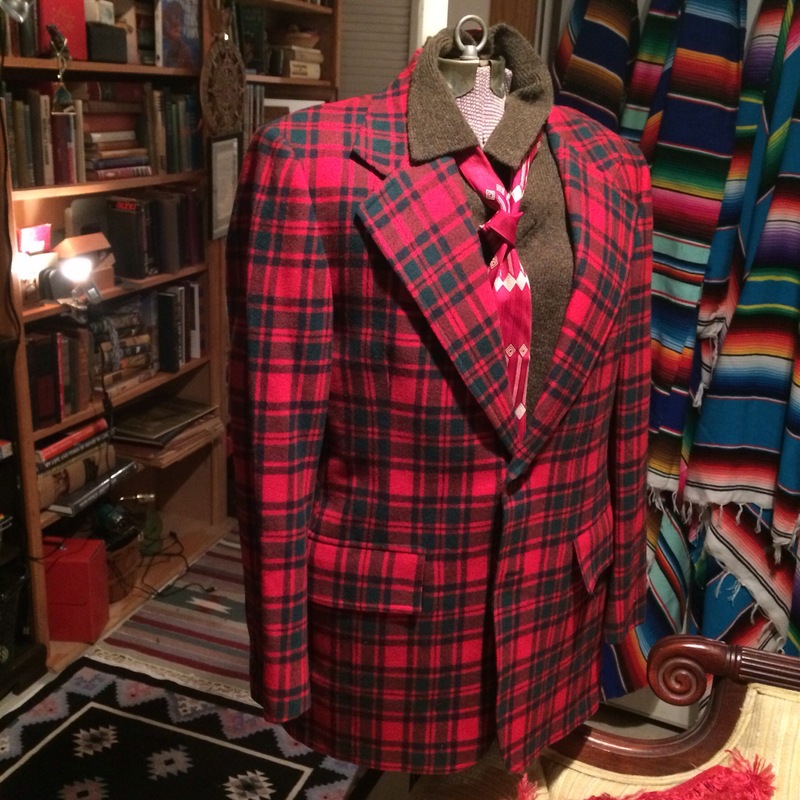 If you need this jacket for your next office event or maybe as a gift for a truly special co-worker then look no further. Leave a comment, we will draw a name . . . And announce the new owner next Saturday right here! 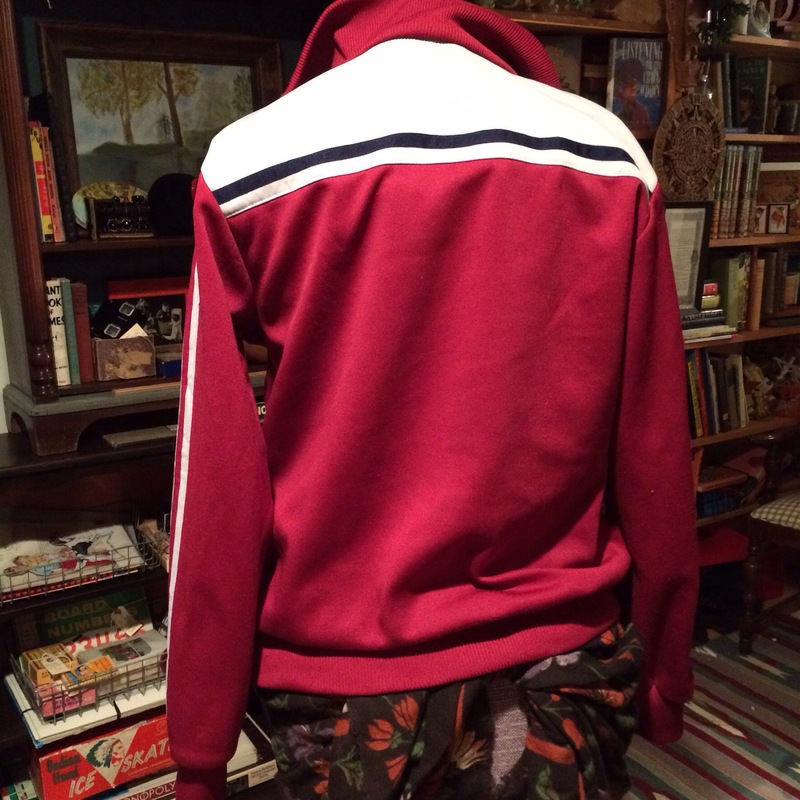 There is only one stipulation, please send a photo of the jacket on the lucky winner. 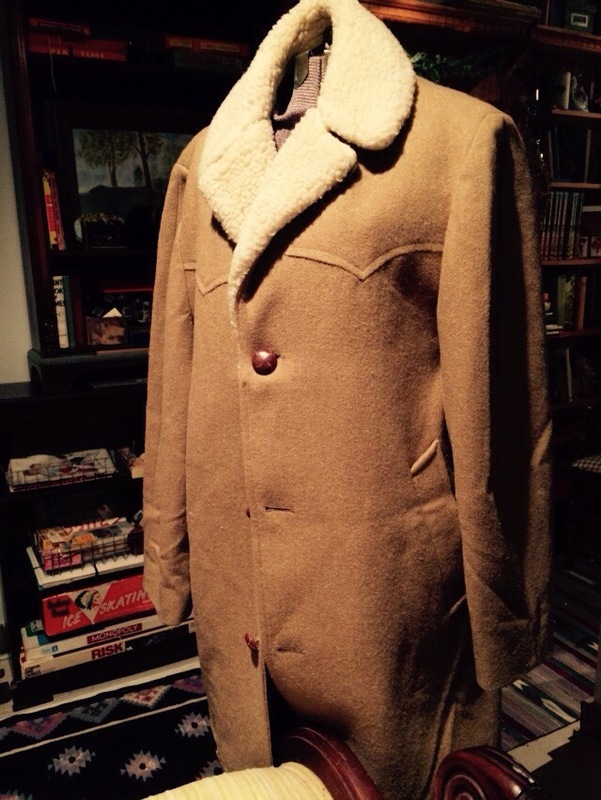 By the way, the jacket is about a size 10. How exciting! Our first give away. If you can’t pick it up, no worries, we will send it to you – quickly. In time for Christmas! I have been watching The Paradise on PBS; I admit that I began watching it as a fix. I missed that other series about Mr. Selfridge. Imagine, all the way from Marshall Field to London. The spirit of the age (the Zeitgeist) is palpable in both series – the optimism in modern science, technology, and industrialization influenced style, fashion and taste. The world, they believed, was a better place for all of humanity. And in many ways, their world view was well-founded on the evidence around them – electricity, communication, transportation and medicine. Their style was a visual display of modern luxury – new luxuries like turning on a light past dark and reading! It was a revolution. Today, the marketplace is brimming with readily available and fashionable clothing; yet all too often, fine craftsmanship has disappeared – at an affordable price. 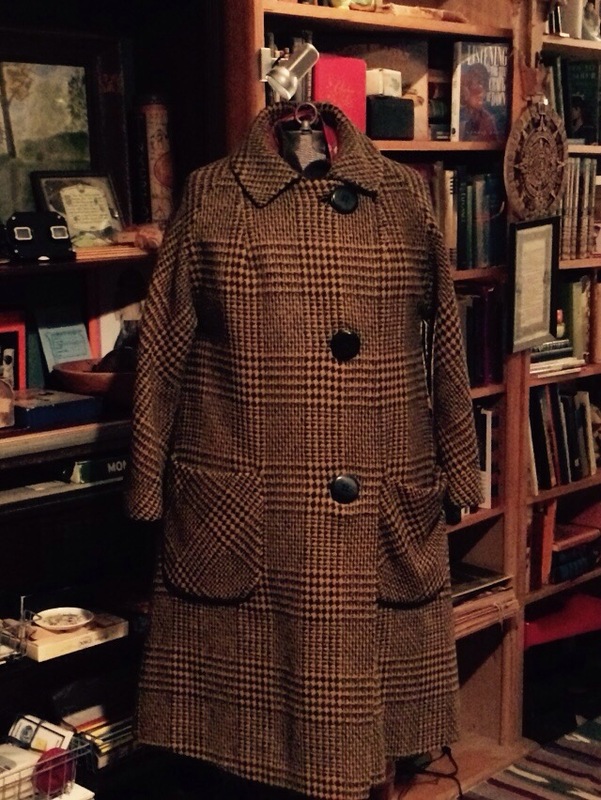 Part of the appeal of vintage fashion is that we can enjoy beautiful materials and workmanship without breaking our budget. 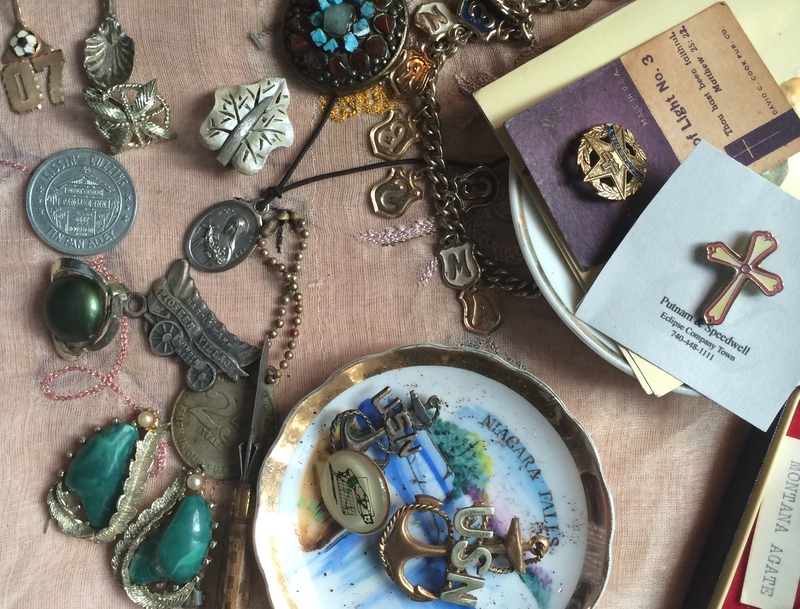 And, there is also social responsibility – vintage goods of all kinds are integral to a sustainable economic system. Whew! 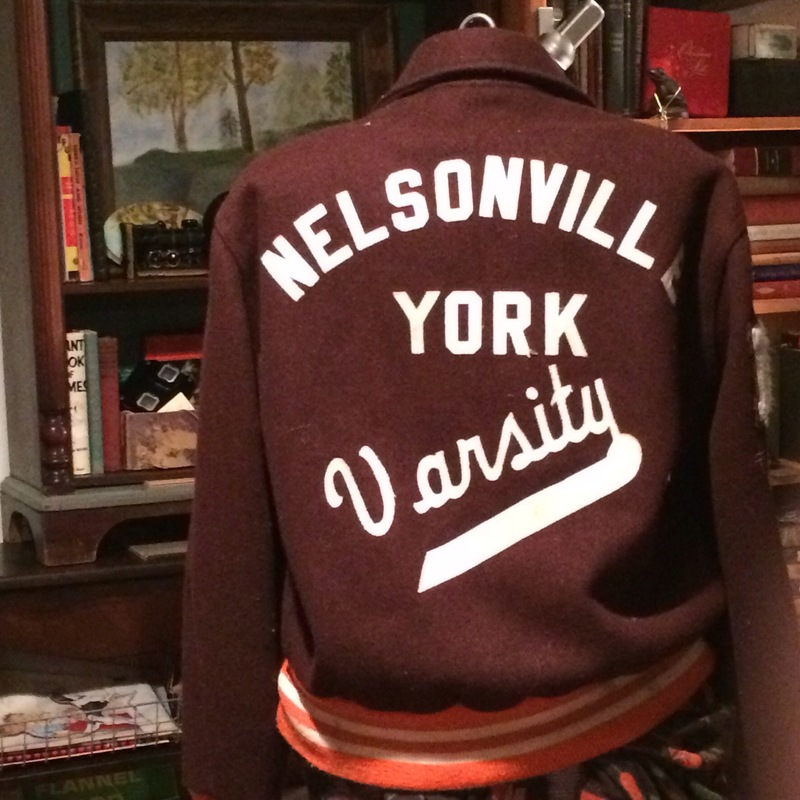 Having said all of that, vintage clothing is a part of history. I enjoy the theater of dress – and the theater created by Mr. Selfridge and the ficitonal, Mr. Moray. I marvel at the clothing Ginger Rodgers wore as she danced away the night, Katherine Hepburn in pants that flowed like a skirt and followed every curve. And so on . 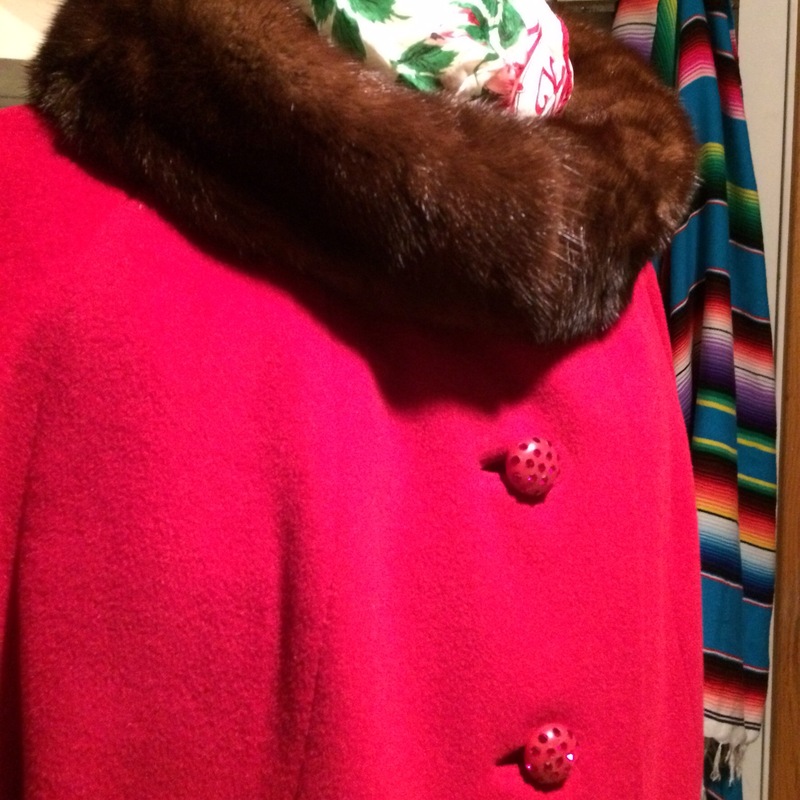 . . like Ingrid Bergman, who looked beautiful no matter what she wore – and still looks beautiful behind a mink stole on a mannequin in a small, very small vintage store. Hmmm, that brings up fur and the bad wrap it has in today’s world (no pun intended) . . . The allure of the forties was elegance. 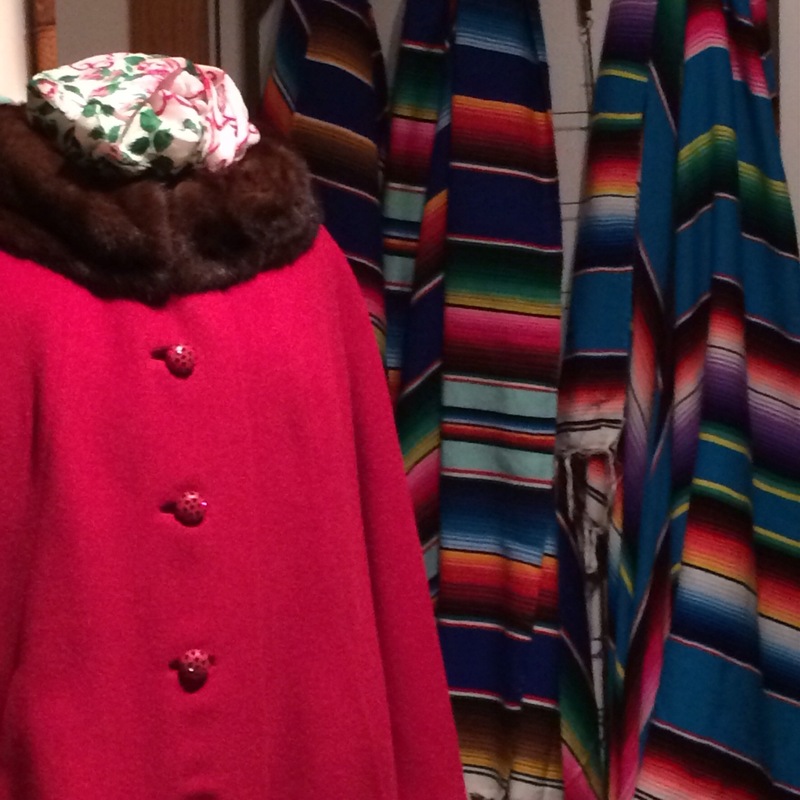 Growing up, there were women who attended church with a fur coat – my great aunt was one of them. It was Chicago. In Chicago, winter is cold – no matter what the temperature, the wind off the lake is cold. . . the antidote before the new man made ultra loft fillings was fur. Fur is warm . 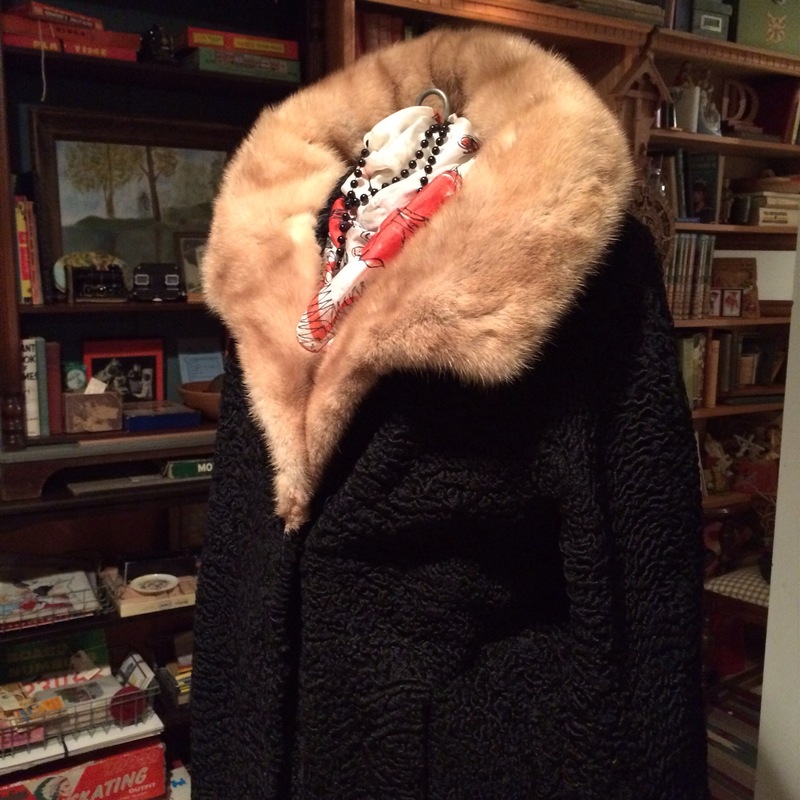 . . Last winter, I wore a vintage fur jacket and now, I do not think that I could give it up. I hate being cold when I am outside – and I like being out of doors. When I run across beautiful things that are appealing and bring to mind an era of fashion then I can imagine that they would add personality, color and even usefulness in the present to a wardrobe. 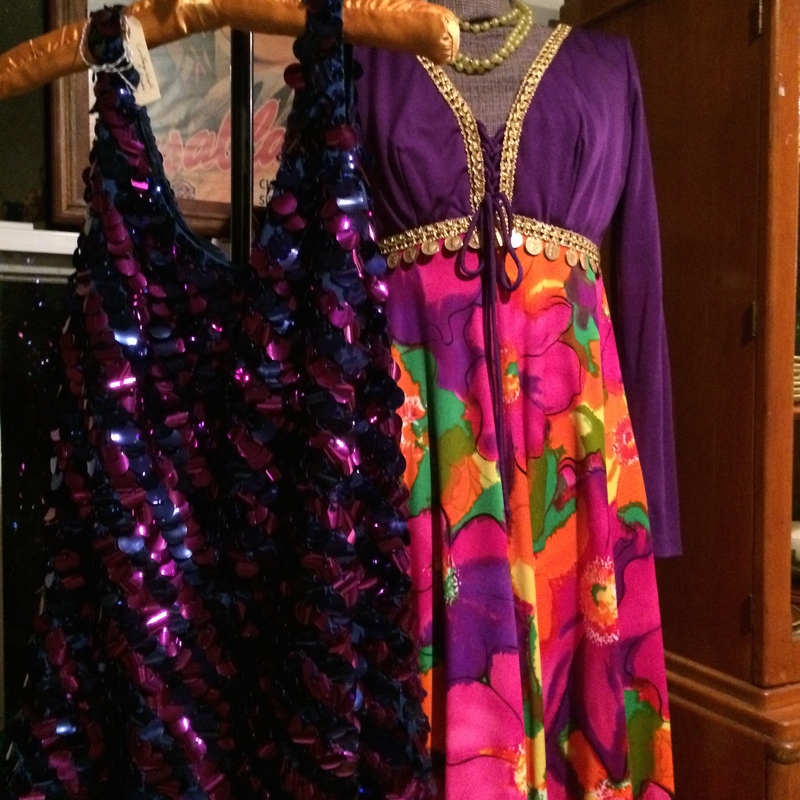 So it is with the sequined dress made in Italy with fine wool and hand sewn sequins that are 1/2 in diameter. I am not so good with a camera – capturing the play of light is difficult and so too, it is impossible to portray the fit. This dress is short enough and tight enough but not form fitting. . . . actually it is perfect! I am also quite taken with the pure all out eighties look of the long dress that takes off from the psychedelia of the seventies . . . .look at the gold coins! Not the kind of dress to wear if you do not want to be noticed. . . . The colors are disco happy. Hard to imagine having a bad time wearing this dress. The detail in this dress is absolutely excellent – lined, the coins are hand applied as is the gold trim. I imagine that shimmery sandals would work well and still allow perfect comfort . 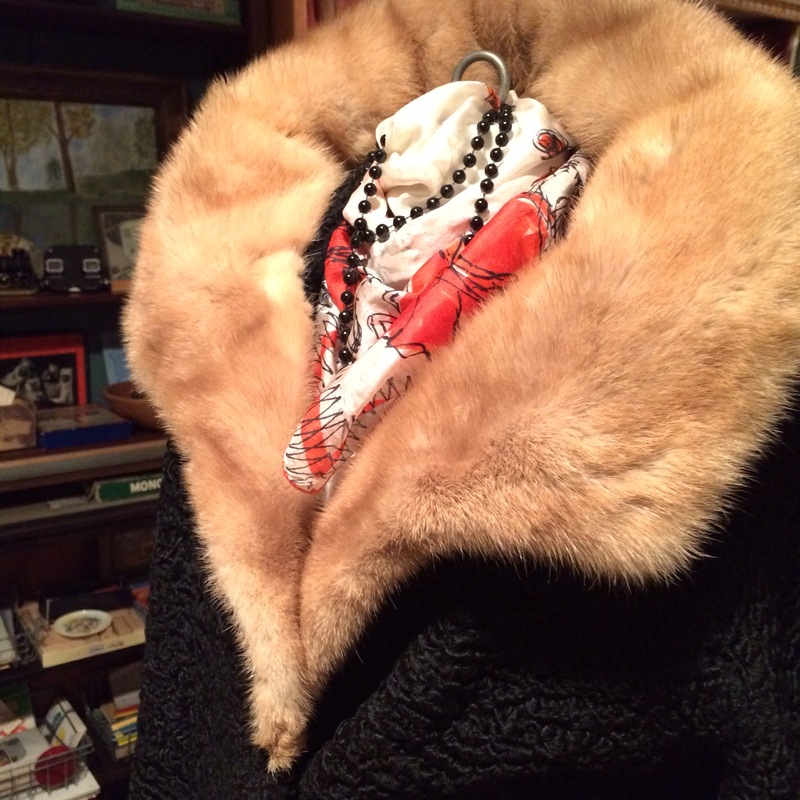 . . my daughter, who knows so much more about fashion than I, suggested the fur stole. And of course, she is right – partly because, this dress seems to require an extraordinary occasion and a puffy coat, well, it would be out of sync . 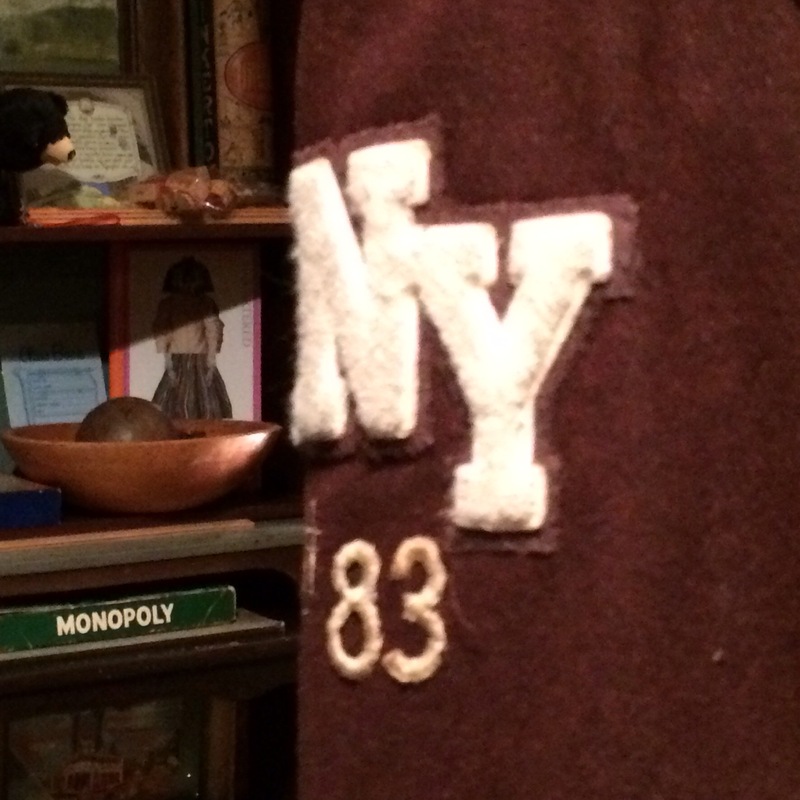 . . but a stole, like a mink stole would make it theater . 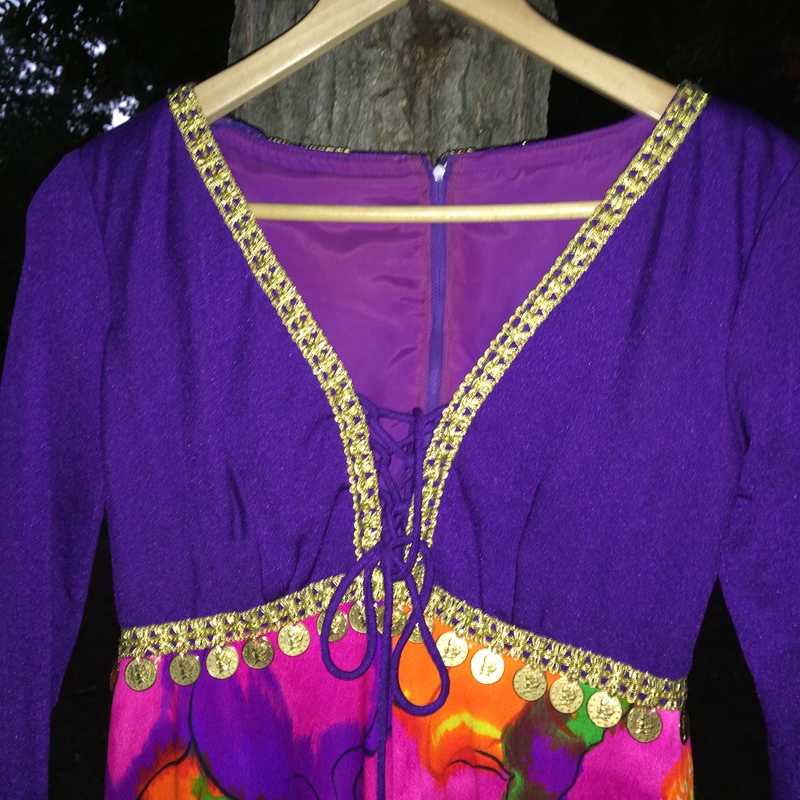 . .
Lots and lots of new things in store that I hope to get online – lots of slip dresses, and new vintage imported from Austin, reminiscent of my hippie past.